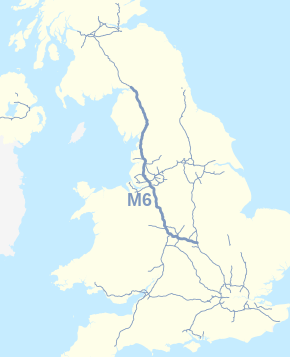 The M6 motorway runs from junction 19 of the M1 at the Catthorpe Interchange, near Rugby via Birmingham then heads north, passing Stoke-on-Trent, Liverpool, Manchester, Preston, Lancaster, Carlisle and terminating at the Gretna junction (J45). Here, just short of the Scottish border it becomes the A74(M) which continues to Glasgow as the M74. As of 2016, the M6, as well as combining with the length of the A14 from Brampton from junction with A1(M), the A74(M) and M74 to the junction with the M8 in Glasgow, forms the longest non-stop motorway in the United Kingdom and one of the busiest. It incorporated the Preston By-pass, the first length of motorway opened in the UK and forms part of a motorway "Backbone of Britain", running north−south between London and Glasgow via the industrial North of England. 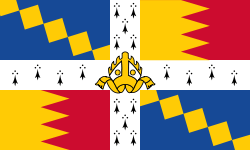 It is also part of the east−west route between the Midlands and the east-coast ports. The section from the M1 to the M6 Toll split near Birmingham forms part of the unsigned E-road E 24 and the section from the M6 Toll and the M42 forms part of E 05. The M6 motorway runs from junction 19 of the M1 and from the beginning of A14 in Catthorpe near Rugby in central England, passes between Coventry and Nuneaton, through Birmingham, Walsall and Stafford and near the major cities of Wolverhampton and Stoke-on-Trent. The motorway has major junctions with the M56 and M62 at Warrington, giving access to Chester, Manchester and Liverpool. The M6 then heads north past Wigan, Preston and Lancaster. After the latter two cities it passes through Cumbria with some parts very close to the edge of the Lake District with a short stretch within the national park boundaries and then passes Carlisle on its way to Gretna, before the motorway becomes the A74(M) a few hundred metres (yards) short of the Scottish border. The section of the M6 that runs over Shap Fell in Cumbria is 1,050 ft (320 m) above sea level, one of the highest points on any motorway in the UK (junction 22 of the M62 on Saddleworth Moor is higher). The motorway engineers here chose to follow the route of the Lancaster and Carlisle Railway engineered by Joseph Locke (now part of the West Coast Main Line) where the motorway runs in a split-level cutting above the railway in the descent from Shap Fell through the Lune Gorge into southern Cumbria. The M6 Toll, Britain's first toll motorway, which bypasses the West Midlands conurbation to the east and north of Birmingham and Walsall and was built to alleviate congestion through the West Midlands, and opened in December 2003. Before the opening of the toll motorway, this section of the M6 carried 180,000 vehicles per day at its busiest point near Wolverhampton (between the junctions with the M54 and M5 motorways), compared with a design capacity of only 72,000 vehicles. Usage, at about 50,000 vehicles, was lower than expected and traffic levels on the M6 were only slightly reduced as a result. The high toll prices, which were set by the operating company and over which the UK government has no influence until 2054, were blamed for the low usage. Much traffic continues to use the M6 or the continued on the M1 and took the A50 or A52. As of July 2012 the road between Junctions 3A and 11A now carries 120,000 motor vehicles every day. ↑ Highways Agency, ed. (2004). "1". M6 Route Management Strategy: Warrington to the Scottish Borders : Final Strategy Summary Brochure, January 2004. 1. 1 (I ed.). Scotland: Highways Agency. p. 54. ↑ Baldwin, Peter; Porter (M.S. ), John; Baldwin, Robert (2004). "72". In Thomas Telford. The Motorway Achievement. I. I (One ed.). London: Thomas Telford. pp. 836–. ISBN 978-0-7277-3196-8. Retrieved 9 July 2012. ↑ Highways Agency, ed. (2004). "1". M6 Route Management Strategy: Warrington to the Scottish Borders : Final Strategy Summary Brochure, January 2004. 1. 1 (I ed.). Scotland: Highways Agency. p. 73. ↑ Frommer's Short (22 December 2011). "3". The Borders and Galloway Regions, Scotland: Frommer's ShortCuts. I. I (I ed.). Scotland: John Wiley & Sons. pp. 56–. ISBN 978-1-118-27111-7. Retrieved 9 July 2012. ↑ "Preston Bypass Opening (Booklet)" (PDF). Retrieved 20 January 2008. ↑ "The Preston By-pass-Enquiry Needed". Practical Motorist and Motor Cyclist. Vol. 5 no. 57. March 1959. p. 803. ↑ British Information Services; Great Britain. Central Office of Information (1 January 1970). "I". Survey of British and Commonwealth affairs. One. I (I ed.). England, United Kingdom: Published for British Information Services by Her Majesty's Stationery Office. Retrieved 9 July 2012. ↑ Great Britain. Central Office of Information. Reference Division; British Information Services (1979). Inland transport in Britain. H.M.S.O. ISBN 978-0-11-700989-9. Retrieved 9 July 2012. 1 2 Institution of Highway Engineers (1981). The Highway engineer. Institution of Highway Engineers. p. 23. Retrieved 9 July 2012. ↑ "''ciht.org.uk''". Ciht.org.uk (Self-published). Retrieved 31 December 2011. ↑ T. G. Carpenter (27 January 2011). Construction in the Landscape: A Handbook for Civil Engineering to Conserve Global Land Resources. Routledge. pp. 143–. ISBN 978-1-84407-923-0. Retrieved 9 July 2012. ↑ "2". The Spectator. 245. F.C. Westley. 1980. Retrieved 9 July 2012. ↑ "M6". The Motorway Archive. Midland Links Motorways. Self-published. Retrieved 9 July 2012. 1 2 "News: Motorway lighting". Autocar. Vol. 137 no. 3978. 13 July 1972. p. 19. ↑ "M6 Carlisle — Gretna". CBRD. Self-published. Retrieved 20 January 2008. ↑ "M6 Carlisle to Guards Mill Extension". Highways Agency. Archived from the original on 10 August 2012. Retrieved 3 May 2014. ↑ "M6 North Extension, United Kingdom". Road Traffic Technology. Retrieved 20 January 2008. ↑ "one year after study". Highways Agency. 11 August 2005. Archived from the original (PDF) on 18 November 2009. Retrieved 24 January 2008. ↑ Great Britain. Parliament. House of Commons (2012). Parliamentary debates: Official report. H.M. Stationery Off. 1 2 "Decision on M6 Upgrade Announced". News Distribution Service for the Government and Public Sector. Archived from the original on 4 May 2008. Retrieved 3 May 2014. ↑ "Hard-shoulder scheme to go nationwide". The Independent. 27 October 2007. Retrieved 25 January 2007. ↑ Baldwin, Peter; John, Porter (M.S. ); Baldwin, Robert; Thomas Telford (2004). "XIV". In Thomas Telford. The Motorway Achievement. I. I (I ed.). London: Thomas Telford. p. 693. ISBN 978-0-7277-3196-8. ↑ "Encouraging better use of roads and the M6". Department for Transport. Archived from the original on 11 August 2007. Retrieved 20 January 2008. ↑ Great Britain: Parliament: House of Commons: Welsh Affairs Committee (22 December 2010). The Severn crossings toll: third report of session 2010–11, report, together with formal minutes and written evidence. The Stationery Office. pp. 58–. ISBN 978-0-215-55570-0. Retrieved 9 July 2012. ↑ "M6 Jct 11A – 19 (Increasing Capacity) Study". Highways Agency. Archived from the original on 10 August 2012. Retrieved 3 May 2014. ↑ "M6 Junctions 13–19 Managed Motorway". ↑ "M1 Jct 19". Retrieved 31 October 2016. ↑ "S.I. 1987/252". Office of Public Sector Information. Retrieved 9 July 2012. ↑ "S.I. 1987/2254". Office of Public Sector Information. Retrieved 9 July 2012. ↑ "S.I. 1990/2659". Office of Public Sector Information. Retrieved 9 July 2012. ↑ "S.I. 1991/1873". Office of Public Sector Information. Retrieved 9 July 2012. ↑ "S.I. 1993/1370". Office of Public Sector Information. Retrieved 9 July 2012. ↑ "S.I. 1997/1292". Office of Public Sector Information. Retrieved 9 July 2012. ↑ "S.I. 1997/1293". Office of Public Sector Information. Retrieved 9 July 2012. ↑ "S.I. 1998/125". Office of Public Sector Information. Retrieved 9 July 2012.